I just love how the red pepper in the mayonnaise gives a little kick to the taste of the sushi. There really isn’t anything to not like about this, if you like spicy tastes. If you don’t, then just adjust the amount of red pepper powder to however you like it. Mix the mayonnaise, miso and red pepper powder. 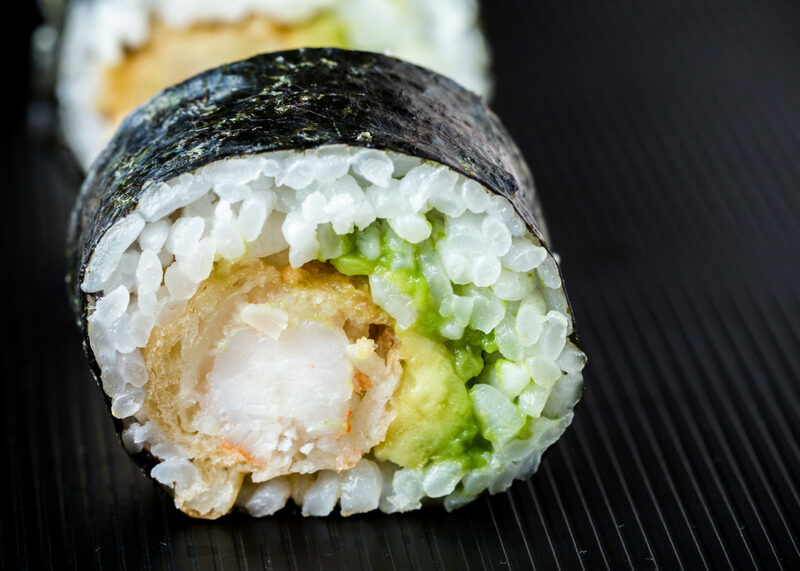 Roll the sushi, using 2 pieces of tempura shrimp, a few slices of avocado, and red pepper mayonnaise as your fillings. Love me a spicy roll…looks good…we take the lazy route and buy the wasabi mayo. Or we make spicy sauce with cream cheese and Franks red hot…heat up the cream cheese a little to make it soft and mix in the franks red hot…yum. I also like to fry up some juliane style jalapeÃƒÂ±os and put a line of that on my roll to add heat. Man my mouth is watering now. Tempura, mayo and red pepper sounds like a good combination. Ralph – Oooh… your spicy solutions sound like they would make me cry! Hehe I’m still a n00b when it comes to spicy foods, I have just started eating wasabi within the last couple of months (it’s Son’s fault that I’m eating spicy now! ), so I’m still a lightweight when it comes to spicy foods. 😛 They sound like fun though (a party in my mouth!) and I’m sure Son would LOVE them! My comment just got eaten so I’m really mad 🙁 but I had a good one!!! WRaghhhh. I think my SIL bought my mom a hand blender and since she’s not much of a tech user, I inherited. I love it for pureeing cream soups in the pot but this sounds like another good use. Never tried making my own mayo … isn’t there a difference in recipe between Japanese and western types mayo though? Anyone have a good recipe for the Japanese (ie Kewpie brand) type? Lara – That sounds like something that would be useful for me! I think Japanese mayo uses different ingredients. For example, the recipe that I killed used miso as an ingredient. But… since I couldn’t make it, I can’t tell you if it was good or not. Definitely will post something if I ever do get it to work! I’ve been trying to find a special recipe. At a local sushi restaurant, I forget the ingredients, but what I really want to know is how do they get the crust? Let me explain. I believe that the filling is tuna (or crab), cream cheese and avacado. After they roll it, I *think* they dip it in tempura and then broil it to have a crispy crust. Then they top it with a tasty sauce that I would also love to make. Has anyone heard of this? Most likely they do broil or bake the roll (or perhaps even fry it) to get a crispy crust. Depending on how it turns out (more crispy or more flaky? ), it is probably either coated with tempura batter or panko flakes. The sauce is probably eel sauce, which is used on quite a bit of sushi. My guess is they deep fry it in a tempura batter and the sauce, if dark brown is an eel sauce or like creamy red is a simple spicy sauce. Could it pasiable that somebody will till me the exect reciepy of -tempura better ? Mark – I have a recipe here. I’ve never made japanese mayo, but the best advice i can give to get a good emulsion is you really have to add the oil one drop at a time, giving your mix a good chance to incorporate the oil as it comes in, at least until you’ve incorporated half of the total oil. I’ve used an eyedropper before for this, but I bet you could use a turkey baster or a kid’s sippy cup, repurposed. I have seen recipes for emulsifications which use blenders…. give that a try if you have one. Oh, and as in previous comments, make sure you add the oil slowly. I do a spicy mayo by using 1Tbsp Hellmann’s Mayo, 1 Tsp Huy Fong Sriracha Sauce (Chili Sauce) and like a 1/4 tsp of Sesame Oil. I stir it all together and use. SOOOO good! Anonymous – It’s been quite a while since I wrote this post, but I believe I used white miso. I am a recent graduate of The International Culinary Schools at The Art Institutes Minnesota. In Garde Manage were taught the art of garnishes and cold foods. We were required to make all our sauces, vinaigrette, mayonnaise etc. by hand, no using electric mixers or anything but a whisk. Mayonnaise is not easy nor is it fun to make this way but it can be done. There is a couple tricks to making it easier though. 1) place the bowl you are mixing in, in a pan with a wet towel in it to hold it as you whisk. Make sure it is snug and has a good base to keep it still and balanced. 2) this tip is very important with anything you are mixing in e.g by hand or with an electric mixer. Whisk or blend all the ingredients together, except the oil first then when while whisking or blending slowly drizzle the oil in. This will help the emulsion come together properly and make it thicken up. Japanese mayonnaise is very similar to Western style mayonnaise but it uses different vinegars such as apple cider or rice and uses MSG.